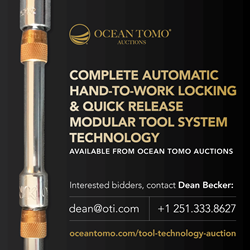 Access the data room for the first complete automatic hand-to-work locking and quick release modular tool system technologies available from Ocean Tomo Auctions, available at no reserve auction. Available from Ocean Tomo Auctions, in a private, no-reserve auction, unique modular tool system patented technology. Ocean Tomo Transactions and Ocean Tomo China announce the opening of the data room for the auction of the first complete automatic hand-to-work locking and quick release modular tool system technologies available from Ocean Tomo Auctions, available at no reserve auction. Using powerful automatic pin locking technology with manual quick release at every tool connection improves productivity and enhances safety for all mechanics’ hand tools and power tools, available at no reserve auction. The portfolio of assets available from Ocean Tomo Auctions, in a private, no-reserve auction, includes worldwide patents, complete production engineering drawings and specifications as well as registered trademarks and trade names related to all automatic hand-to-work pin locking and quick release mechanics’ hand and power tools. Ocean Tomo, the Intellectual Capital Merchant Banc™ firm provides companies with financial services related to intellectual property and intangible assets. Ocean Tomo assists clients – corporations, law firms, governments and institutional investors – in realizing Intellectual Capital Equity®value broadly defined.